Talia Shulze's work investigates the ways that humans alter and approximate nature. 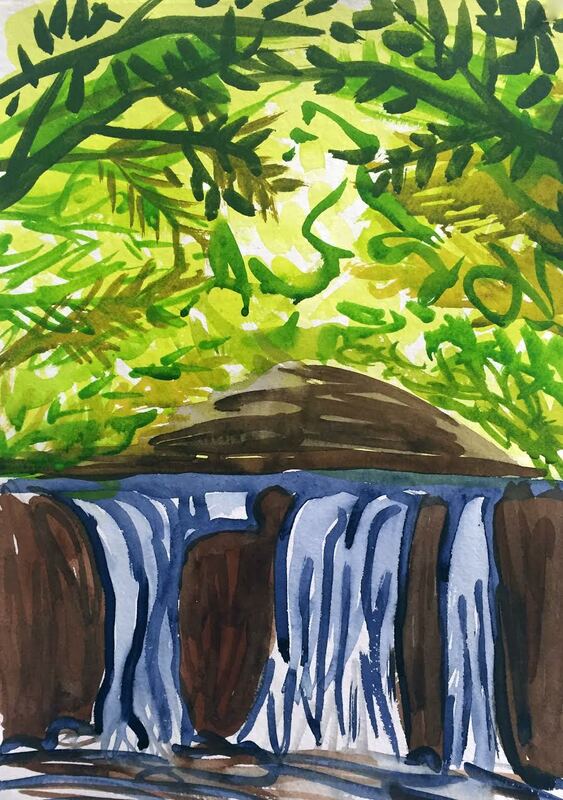 Her intimate watercolors document the waterfalls of Rickett's Glen, a stretch of growth forest in Pennsylvania that loggers found too steep to be worth taking advantage of. Talia Shulze was born in 1984 Minneapolis, MN and currently lives in Brooklyn. In 2006 she received her BFA in Sculpture at the Virginia Commonwealth University in Richmond, Virginia. Talia has co-curated and participated in several group shows in New York and beyond. Talia’s practice is expansive and varied, immersing herself in experimentation from ceramics to gifs, painting on screens, canvas and photographs and most recently watercolors made on wilderness trips. She is an avid forager for mushrooms. The luminous trumpets in Pamela Sabroso's glass sculptures attempt to visually interpret a delusional yet enlightened state. The trumpets are a playful, mischievous sprite that inspire your creativity. Pamela Sabroso was born in 1982 in La Guaira, Venezuela. In 2008 she received a B.F.A in Crafts/ Material Studies from Virginia Commonwealth University. Shortly after she moved to Brooklyn, NY where she currently lives and works as a freelance glassblowing assistant and fabricator. She has exhibited her collaborative work with Alison Siegel at Urban Glass and Heller Gallery. She continues to persue her own career as an artist using glass unconventionally. Katrina Fimmel's works are a surrealistic visual exploration of the psychological landscapes underpinning late capitalism in the eroding Imperialist American empire. Katrina Fimmel was born in 1980 in Beaumont, TX and is currently in the process of moving from Brooklyn to Gainesville, FL. In 2007 she received her BFA in Painting and Printmaking at the Virginia Commonwealth University in Richmond, Virginia. Katrina has had two solo shows in NYC and has co-curated and participated in several group shows in New York and beyond. 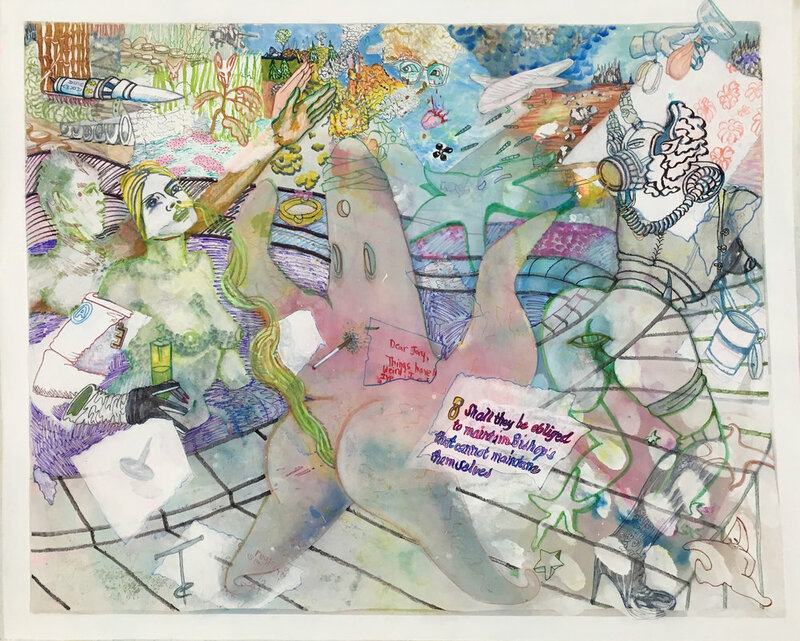 Katrina has maintained a complex, experimental and subversive painting practice since the early 2000s. Katrina is committed to making art that engages with disturbing content and social issues in order to produce works of uncanny psychological realism sublimated into ethereal but anarchic painting, ethereal painting techniques and ruthlessly zany humor.